Arranged by colony it lists all Colonial and senior local civil servants. Until 1951 there are statements of service for Colonial Civil Servants. Clifton’s first statement of service is in 1895 two years after his appointment to the Customs service in the Gold Coast and his last entry is in 1937. Supervisor of Customs, Gold Coast Colony 1893. GRANNUM, Reginald Clifton, CMG (1925). Among the annual statistics for the colony there are establishment lists. These describe all people employed by the colonial government, their dates of appointment, salary, and more importantly how they were appointed. If someone was selected or appointed by the Colonial Secretary he, or she, was a Colonial Civil Servant and you may find personal information in the National Archives. If he was appointed by the governor or department he was a local civil servant and surviving applications may be held locally. Clifton’s first appointment was as 2nd clerk in the Governor’s Office, Grenada, 28th April 1891, he was appointed locally by the governor and started on a salary of £125 per annum (Grenada Blue Book of Statistics, 1891, CO 106/85, M7). However, his appointment as 2nd class supervisor of customs, Gold Coast, confirms that he was a Colonial Civil Servant. He was appointed on 11 October 1893 by the governor having been selected by the Colonial Secretary at £225 per annum with quarters. He arrived in the colony on 30 October having first received training by the Board of Customs in London and Liverpool (Gold Coast correspondence, 17 March 1893, Gov: Griffith, no 80, CO 96/232). Government gazettes are the colonial equivalent of the London Gazette and include such information as leave, resumption of duty, appointments, promotions, transfers, resignations and retirement, and shipping intelligence. Clifton often travelled to England for official purposes, training and for extended leave, especially once he had family in Britain, and these can help find passenger lists. These summarise all letters received by the Colonial Office and until 1926 are arranged by the author of the letter by date of receipt. They are the primary source into Colonial Office Original Correspondence series and are particularly useful because they describe letters which no longer exist. Among the correspondence written by or about Clifton there are application forms, requests for transfer and promotion, notification of leave, request for extension of leave, requests for advances of pay, travel arrangements, and notification of arrival in colonial territories and the UK. Most of the routine correspondence has not survived and this is highlighted in the registers with the stamp Destroyed Under Statute. The surviving correspondence is found in the associated Original Correspondence series. Even where the letters have not survived the information can be valuable. For example, between July and October 1917 his wife Ada wrote to the Colonial Office asking for assistance to return to British Guiana. Although none of her letters have been kept the summaries make reference to her receiving a passport for a period where there are no indexes to the registers and the name of the ship she travelled on which helped find the a passenger list giving the initials, sexes and approximate ages of their youngest three children. The most revealing records are the surviving letters in Original Correspondence series. To prevent fruitless hours of searching for personal information it is best to use the registers of correspondence first to identify which correspondence has survived. After 1926 both the registers of correspondence and original correspondence become more difficult to use: they are arranged by subject files and do not include subject indexes. Although there is a contents list to the files it is very difficult to find information on individuals. This means that is there very little about Clifton’s career after 1926. These Colonial Office sources can be used to find out more about the official as a person rather than an officer. The letters show Clifton to be highly ambitious regularly seeking transfers to more promising roles or promotion. Although, he had his faults he was highly regarded and received many favourable reports. It did not pay well but he found the colonial service challenging and rewarding. Although working in 6 colonies he remained unsettled and did not consider any home. The documents say very little about his family but give sufficient information to carry out research in other sources. There are references to 45 letters written by Clifton either directly to the Colonial Office or forwarded by the governor and other senior officials. About half of these survive. Only a few of these are official letters accounting for his decisions, informing officials of his movements, or awaiting instructions. The majority are more personal describing his personal and financial circumstances, requests for extended leave, or applications and requests for promotion or transfer. In addition three application forms have survived. Reginald Clifton Grannum was born in Barbados on 17 April 1872 to Edward Thomas Grannum. At the age of 16 he worked for a year in Messrs Grannum & Skeete Public Accountants, this was probably his father’s office as his father was an eminent accountant who was later elected in to the House of Assembly; later he too became a Colonial Civil Servant as Auditor General of Barbados. In May 1889 aged 17 he enrolled at the Ontario Business College, Belleville, Ontario, Canada and graduated in October that year where he says “he obtained the highest marks ever given for bookkeeping“. He worked in Belleville for a short time for Messrs Warrington Brothers, merchants and served in the 15th battalion Argyle Light Infantry where he became acquainted with several barristers including his future father-in-law (Application and testimonials enclosed in CO 321/143, 10 Sept 1892, Gov: Hutchinson, no 94). He left Belleville for a career in the Colonial Civil Service, for whom he served over 37 years in 6 countries. The Colonial Office List gives an accurate summary of his career but the Colonial Office records expand on this information fleshing out his activities and other local appointments. For example, prior to his appointment as Supervisor of Customs in the Gold Coast Colony in 1893 he had to travel to England to receive training by the Board of Customs in London where he “acquired intelligent knowledge of the practical outdoor customs work” (Entry in the Gold Coast Register of Correspondence CO 343/13, Misc Offices: Customs 25 August 1893 – the original letter has not survived) and between 16 September and 10 October 1893 received additional training in Liverpool. Between 20 July and 11 August 1894 he was temporarily promoted to District Commissioner and Registrar of Marriages for the Prampram District (Gold Coast Government Gazette, 20 July 1894, CO 99/8, 1894 p228). He was very ambitious applying for promotions and transfers to further his career but more importantly to improve conditions for his family. Within four months of arriving in the Gold Coast Colony as Supervisor of Customs he applied for the post of cashier in the Treasury Department and later in the same year he applied for the post of Assistant Auditor for Gold Coast and Lagos. The governor recommended the appointment saying that “he has performed his duties with singular ability, zeal and efficiency” and referred the comptroller to Clifton’s accountancy training and diploma (Correspondence in CO 96/243, fos 436-442, 19 Feb 1894, Acting Gov FM Hodgson, no 52). The Audit Department approved the appointment and he undertook his duties from 8 May 1895. However, in June 1896, just over a year later he was appointed Local Auditor for Sierra Leone and the Gambia a position he kept for almost 8 years. Tropical fevers, especially malaria were a common hazard for people working in West Africa and fifteen days after his arrival in Sierra Leone he came down with a fever and the Acting Colonial Surgeon recommended that owing to his unsatisfactory state of health to proceed to England by the earliest opportunity. Clifton resisted this as he had just returned but the surgeon continued: “I feel compelled to urge it on medical grounds as I think his remaining any longer may expose him to unnecessary risk and eventually series consequences. I refuse to hold myself responsible for this officer’s health, should my advice not be adopted” (Correspondence in CO 267/426, fos 256-261, 14 Aug 1896, Gov 241). He recovered but unfortunately fever was to take the life of his first wife in 1900. On 16 March 1903 he married his second wife Ada Austin in Glastonbury, Somerset. Probably because of the loss of his first wife, Ada remained in England and the correspondence contains more urgent requests for transfers “to some colony where it may be possible for my wife to live“(One of two letters enclosed in CO 96/453, Individuals ‘G’, 6 January 1906 c/o The Grosvenor Club, Piccadilly, London; another letter is addressed: 14 Marine Parade, Hastings. He repeats this request in his application for transfer forwarded by the governor a month later in CO 96/440, 4 Feb 1906, Deputy Gov Bryan, no 73). 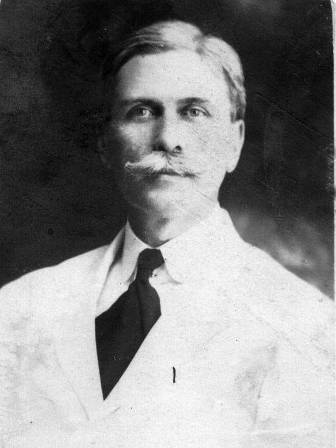 He finally got his wish in 1908, five years after his marriage, where he was promoted as Receiver General British Guiana. During these five years his visits to England were infrequent but were enough for Clifton and Ada to have two children: Clifton Winnington in 1906 and Dorothy Edmee in 1907. On 25 November 1908 the family sailed from Southampton for Demerara onboard the Royal Mail Steam Packet ship Trent: Mr RC Grannum, Mrs Grannum, Master CW Grannum (child between 1 and 12) and Miss DE Grannum (infant less than a year old) (Passenger list of the Trent, BT 27/600). (letter dated 3 July 1913, enclosed in governor’s correspondence 5 July 1913, gov 203, governor Egerton, CO 111/589). On 30 September 1915 from his father-in-law’s farm in Somerset he writes: “As I am anxious to return to West Africa I am prepared to accept an appointment at £750 a year rather than return to British Guiana where I have been for nearly seven years without being able to return to Europe“. (Private letter, Tilham Street, Baltonsborough, Somerset; Individuals ‘G’, CO 111/603) He was unsuccessful and on 26 August 1916 reluctantly returned alone to British Guiana on the Imataka from Liverpool (BT 27/873); his family later rejoined him in 1917 (Grampion, left Liverpool 18 October 1917 bound for Quebec and Montreal, BT 27/882 (Oct pt1), where they must have changed for a ship for British Guiana). 28 February 1919: after ten years of strenuous work as Treasurer of the Colony I find myself in a far worse financial position today than when I came to the Colony, a position, moreover, which causes me the gravest anxiety and which is due the fact that my four children, have now reached an age when their education is becoming a heavy addition to my expences … In order to keep free from debt I and my family for the past two years have had to dispense with the comforts of a home and exist in boarding houses (Enclosure in CO 111/622, 7 March 1919, Gov Confidential: Gov Collet. This letter also summarises his career). 16 November 1920: It is more than four years since I last saw my eldest son who is fourteen years of age and is at school in England, and my three younger children also have reached ages at which, for many reasons, it is desirable that they should leave the Colony. But when, as I hope will be possible, they go to England early next year, I fear I shall have seen the last of them in their childhood, unless this application has the good fortune to meet with success (Enclosure in CO 111/632, 18 November 1920, gov 570: gov Collet). He had to endure almost two more years before he took up his new post on 1 September 1922 as Treasurer for Kenya where he remained until his retirement on 1 February 1930 aged 58. Unfortunately, the records say very little about his life in Kenya. Reports, comments and recommendations made by officials in despatches and on attached minute sheets give an interesting insight into Clifton’s ability and character. He was highly regarded and except for one incident early in his career where he was censured for disobeying the governor’s instruction and for going behind his back, his ability and professionalism seem faultless. For example, Deputy governor Bryan’s report on his application for a transfer in February 1906 noted: “Mr Grannum is an excellent Treasury Officer and if he obtained a transfer from the Gold Coast his gain will be a distinct loss to the Colony. The very necessary reforms which have been effected in the organization of the local Treasury during the past two years have, in most cases, been initiated as Acting Treasury, drawn up clear and comprehensive Standing Orders which have long been required, for the Department” (4 Feb 1906, Gov 73: Deputy Gov Bryan in CO 96/440). In 1907 Governor Rodger concurs: “It is no exaggeration to say that practically all the good Treasury work of the last three years is due, directly or indirectly to Mr Grannum’s financial ability and indefatigable industry” (13 May 1907, Gov 181: Gov Rodger, CO 96/458). However, the remarks are more damning about his personality: The minutes attached to his request for a transfer dated 11 March 1912 an unnamed Colonial Office official remarks “I have found Mr Grannum a loyal painstaking Officer who knows his duty thoroughly as far as I can judge. He is somewhat wanting in tact which makes his work needlessly difficult for himself and adds to the work of others” ( In CO 111/583, 15 March 1912, Gov confidential: OAG Cox). In 1913 two senior officers petition the Colonial Secretary against the governor’s recommendations temporarily promoting Clifton as Colonial Secretary of British Guiana. An official remarks in the minutes “no doubt much of the trouble is due to the personal unpopularity of Mr Grannum an able, but brusque Barbadian” (in CO 111/590 , 1 August 1913, Gov confidential: Gov Egerton). Unfortunately, nothing describes the context of this statement. In response to another request for a transfer in August 1915 the minutes say: “a very good man, apparently at times little aggressive and tactless“. Another minute notes: “I would answer him as coldly as possible. His letter is brief to the point of impertinence. There is no financial post for him in Nigeria, & as far as I can see he is not fit for any other kind of post” (CO 111/603 , minutes on a private letter applying for a transfer, 18 August 1915, Individuals ‘G’: RC Grannum). The Colonial Office records reveal a little about his brother Edward Allan, with whom he worked in Sierra Leone, his father Edward Thomas and his second wife Ada, but they do not say anything about his first wife or his four children. However, there are clues which lead to other sources. They had met when he was studying and working in Belleville, and one of his references was from JH Simpson his future father-in-law, but there is no indication in the Colonial Office records that he travelled to Canada during his career. However, a search of passenger lists show that on 12 September 1896 he arrived at Ellis Island on the Umbria from Liverpool en route to British Columbia (retrieved from http://www.ellisislandrecords.org). This was interesting because he was convalescing from fever having been granted 6 months leave on the grounds of ill-health from 14 August 1896. He arrived in Liverpool on 1st September but his health had improved enough for Clifton within a few days to board a ship bound for America. Another online database confirms that he was going to British Columbia to get married: 7 November 1896, at Nanaimo, British Columbia, Reginald Clifton Grannum married Alice Edith Simpson (British Columbia Archives (http://www.bcarchives.bc.ca), 1896-09-094071 / Roll b11380 ). Their eldest children: Clifton Winnington and Dorothy Edmee were born in England but Reginald Anthony and Joan Yvonne were born in Barbados where Clifton’s family lived; he took extended leave in Barbados at about the time they were born. After Clifton retired in 1930 they remained in Kenya for a few years. Ada and Clifton later moved to Minorca where they were evacuated by the Royal Navy during the Spanish Civil War and finally settled in Jersey. They remained there during the German occupation of the island and he died on 7 January 1946 a few months after the end of the war aged 72. Ada left Jersey to live with her family in East Africa and later South Africa where she died in 1966 aged 93. Her ashes where brought back to England and are buried in Baltonsborough, Somerset. Note: The photograph is from my personal collection. It is undated but he looks to be in his mid- to late-20s so c1900. This entry was posted in Biographies, Grannum research and tagged Colonial Office records, Reginald Clifton Grannum (1872-1946), The National Archives. Bookmark the permalink.